Charles I (19 November 1600 – 30 January 1649)[a] was the monarch over the three kingdoms of England, Scotland, and Ireland from 27 March 1625 until his execution in 1649. After his succession, Charles quarrelled with the Parliament of England, which sought to curb his royal prerogative. Charles believed in the divine right of kings, and was determined to govern according to his own conscience. Many of his subjects opposed his policies, in particular the levying of taxes without parliamentary consent, and perceived his actions as those of a tyrannical absolute monarch. 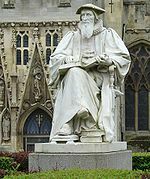 His religious policies, coupled with his marriage to a Roman Catholic, generated the antipathy and mistrust of Reformed groups such as the English Puritans and Scottish Covenanters, who thought his views were too Catholic. He supported high church Anglican ecclesiastics, such as Richard Montagu and William Laud, and failed to aid Protestant forces successfully during the Thirty Years' War. His attempts to force the Church of Scotland to adopt high Anglican practices led to the Bishops' Wars, strengthened the position of the English and Scottish parliaments, and helped precipitate his own downfall. From 1642, Charles fought the armies of the English and Scottish parliaments in the English Civil War. After his defeat in 1645, he surrendered to a Scottish force that eventually handed him over to the English Parliament. Charles refused to accept his captors' demands for a constitutional monarchy, and temporarily escaped captivity in November 1647. Re-imprisoned on the Isle of Wight, Charles forged an alliance with Scotland, but by the end of 1648 Oliver Cromwell's New Model Army had consolidated its control over England. Charles was tried, convicted, and executed for high treason in January 1649. The monarchy was abolished and a republic called the Commonwealth of England was declared. The monarchy would be restored to Charles's son, Charles II, in 1660. The second son of King James VI of Scotland and Anne of Denmark, Charles was born in Dunfermline Palace, Fife, on 19 November 1600. At a Protestant ceremony in the Chapel Royal of Holyrood Palace in Edinburgh on 23 December 1600, he was baptised by David Lindsay, Bishop of Ross, and created Duke of Albany, the traditional title of the second son of the King of Scotland, with the subsidiary titles of Marquess of Ormond, Earl of Ross and Lord Ardmannoch. Eventually, Charles apparently conquered his physical infirmity, which might have been caused by rickets. He became an adept horseman and marksman, and took up fencing. Even so, his public profile remained low in contrast to that of his physically stronger and taller[b] elder brother, Henry Frederick, Prince of Wales, whom Charles adored and attempted to emulate. However, in early November 1612, Henry died at the age of 18 of what is suspected to have been typhoid (or possibly porphyria). Charles, who turned 12 two weeks later, became heir apparent. As the eldest surviving son of the sovereign, Charles automatically gained several titles (including Duke of Cornwall and Duke of Rothesay). Four years later, in November 1616, he was created Prince of Wales and Earl of Chester. Unfortunately for James, negotiation with Spain proved generally unpopular, both with the public and with James's court. The English Parliament was actively hostile towards Spain and Catholicism, and thus, when called by James in 1621, the members hoped for an enforcement of recusancy laws, a naval campaign against Spain, and a Protestant marriage for the Prince of Wales. James's Lord Chancellor, Francis Bacon, was impeached before the House of Lords for corruption. The impeachment was the first since 1459 without the king's official sanction in the form of a bill of attainder. The incident set an important precedent as the process of impeachment would later be used against Charles and his supporters: the Duke of Buckingham, Archbishop William Laud, and the Earl of Strafford. James insisted that the House of Commons be concerned exclusively with domestic affairs, while the members protested that they had the privilege of free speech within the Commons' walls, demanding war with Spain and a Protestant Princess of Wales. Charles, like his father, considered the discussion of his marriage in the Commons impertinent and an infringement of his father's royal prerogative. In January 1622, James dissolved Parliament, angry at what he perceived as the members' impudence and intransigence. On 23 August 1628, Buckingham was assassinated. Charles was deeply distressed. According to Edward Hyde, 1st Earl of Clarendon, he "threw himself upon his bed, lamenting with much passion and with abundance of tears". He remained grieving in his room for two days. In contrast, the public rejoiced at Buckingham's death, which accentuated the gulf between the court and the nation, and between the Crown and the Commons. Although the death of Buckingham effectively ended the war with Spain and eliminated his leadership as an issue, it did not end the conflicts between Charles and Parliament. It did, however, coincide with an improvement in Charles's relationship with his wife, and by November 1628 their old quarrels were at an end. Perhaps Charles's emotional ties were transferred from Buckingham to Henrietta Maria. She became pregnant for the first time, and the bond between them grew stronger. Together, they embodied an image of virtue and family life, and their court became a model of formality and morality. Shortly after the prorogation, without the means in the foreseeable future to raise funds from Parliament for a European war, or the influence of Buckingham, Charles made peace with France and Spain. The following eleven years, during which Charles ruled England without a Parliament, are referred to as the personal rule or the "eleven years' tyranny". Ruling without Parliament was not exceptional, and was supported by precedent. 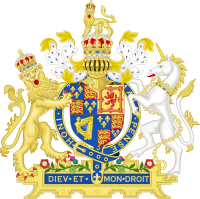 [d] Only Parliament, however, could legally raise taxes, and without it Charles's capacity to acquire funds for his treasury was limited to his customary rights and prerogatives. Farthing of Charles I, showing a crown over two sceptres in saltire on the obverse. The two sceptres represent the two kingdoms of England and Scotland. The chief tax imposed by Charles was a feudal levy known as ship money, which proved even more unpopular, and lucrative, than tonnage and poundage before it. Previously, collection of ship money had been authorised only during wars, and only on coastal regions. Charles, however, argued that there was no legal bar to collecting the tax for defence during peacetime and throughout the whole of the kingdom. Ship money, paid directly to the Treasury of the Navy, provided between £150,000 to £200,000 annually between 1634 and 1638, after which yields declined. Opposition to ship money steadily grew, but the 12 common law judges of England declared that the tax was within the king's prerogative, though some of them had reservations. The prosecution of John Hampden for non-payment in 1637–38 provided a platform for popular protest, and the judges found against Hampden only by the narrow margin of 7–5. The king also derived money through the granting of monopolies, despite a statute forbidding such action, which, though inefficient, raised an estimated £100,000 a year in the late 1630s. [f] One such monopoly was for soap, pejoratively referred to as "popish soap" because some of its backers were Catholics. Charles also raised funds from the Scottish nobility, at the price of considerable acrimony, by the Act of Revocation (1625), whereby all gifts of royal or church land made to the nobility since 1540 were revoked, with continued ownership being subject to an annual rent. In addition, the boundaries of the royal forests in England were restored to their ancient limits as part of a scheme to maximise income by exploiting the land and fining land users within the reasserted boundaries for encroachment. The focus of the programme was disafforestation and sale of forest lands for conversion to pasture and arable farming, or in the case of the Forest of Dean, development for the iron industry. Disafforestation frequently caused riots and disturbances including those known as the Western Rising. When Charles attempted to impose his religious policies in Scotland he faced numerous difficulties. Although born in Scotland, Charles had become estranged from his northern kingdom; his first visit since early childhood was for his Scottish coronation in 1633. To the dismay of the Scots, who had removed many traditional rituals from their liturgical practice, Charles insisted that the coronation be conducted using the Anglican rite. In 1637, the king ordered the use of a new prayer book in Scotland that was almost identical to the English Book of Common Prayer, without consulting either the Scottish Parliament or the Kirk. Although it had been written, under Charles's direction, by Scottish bishops, many Scots resisted it, seeing the new prayer book as a vehicle for introducing Anglicanism to Scotland. On 23 July, riots erupted in Edinburgh upon the first Sunday of the prayer book's usage, and unrest spread throughout the Kirk. The public began to mobilise around a reaffirmation of the National Covenant, whose signatories pledged to uphold the reformed religion of Scotland and reject any innovations that were not authorised by Kirk and Parliament. When the General Assembly of the Church of Scotland met in November 1638, it condemned the new prayer book, abolished episcopal church government by bishops, and adopted presbyterian government by elders and deacons. At the battle of Naseby on 14 June 1645, Rupert's horsemen again mounted a successful charge against the flank of Parliament's New Model Army, but Charles's troops elsewhere on the field were pushed back by the opposing forces. Charles, attempting to rally his men, rode forward but as he did so, Lord Carnwath seized his bridle and pulled him back, fearing for the king's safety. Carnwath's action was misinterpreted by the royalist soldiers as a signal to move back, leading to a collapse of their position. The military balance tipped decisively in favour of Parliament. There followed a series of defeats for the royalists, and then the Siege of Oxford, from which Charles escaped (disguised as a servant) in April 1646. He put himself into the hands of the Scottish presbyterian army besieging Newark, and was taken northwards to Newcastle upon Tyne. After nine months of negotiations, the Scots finally arrived at an agreement with the English Parliament: in exchange for £100,000, and the promise of more money in the future,[g] the Scots withdrew from Newcastle and delivered Charles to the parliamentary commissioners in January 1647. Charles at his trial, by Edward Bower, 1649. He let his beard and hair grow long because Parliament had dismissed his barber, and he refused to let anyone else near him with a razor. He walked under guard from St James's Palace, where he had been confined, to the Palace of Whitehall, where an execution scaffold had been erected in front of the Banqueting House. Charles was separated from spectators by large ranks of soldiers, and his last speech reached only those with him on the scaffold. He blamed his fate on his failure to prevent the execution of his loyal servant Strafford: "An unjust sentence that I suffered to take effect, is punished now by an unjust sentence on me." He declared that he had desired the liberty and freedom of the people as much as any, "but I must tell you that their liberty and freedom consists in having government ... It is not their having a share in the government; that is nothing appertaining unto them. A subject and a sovereign are clean different things." He continued, "I shall go from a corruptible to an incorruptible Crown, where no disturbance can be." The executioner was masked and disguised, and there is debate over his identity. The commissioners approached Richard Brandon, the common hangman of London, but he refused, at least at first, despite being offered £200. It is possible he relented and undertook the commission after being threatened with death, but there are others who have been named as potential candidates, including George Joyce, William Hulet and Hugh Peters. The clean strike, confirmed by an examination of the king's body at Windsor in 1813,[h] suggests that the execution was carried out by an experienced headsman. As Duke of York, Charles bore the royal arms of the kingdom differenced by a label Argent of three points, each bearing three torteaux Gules. As the Prince of Wales, he bore the royal arms differenced by a plain label Argent of three points. As king, Charles bore the royal arms undifferenced: Quarterly, I and IV Grandquarterly, Azure three fleurs-de-lis Or (for France) and Gules three lions passant guardant in pale Or (for England); II Or a lion rampant within a tressure flory-counter-flory Gules (for Scotland); III Azure a harp Or stringed Argent (for Ireland). In Scotland, the Scottish arms were placed in the first and fourth quarters with the English and French arms in the second quarter. Charles I's five eldest children, 1637. Left to right: Mary, James, Charles, Elizabeth and Anne. Elizabeth 29 December 1635 8 September 1650 No issue. Anne 17 March 1637 5 November 1640 Died young. Catherine 29 June 1639 29 June 1639 Born and died the same day. Henrietta 16 June 1644 30 June 1670 Married Philip, Duke of Orléans (1640–1701) in 1661. Had issue. ^ All dates in this article are in the Old Style (Julian calendar) used in Great Britain throughout Charles's lifetime; however, years are assumed to start on 1 January rather than 25 March, which was the English New Year. ^ Charles grew to a peak height of 5 feet 4 inches (163 cm). ^ Rubens, who acted as the Spanish representative during peace negotiations in London, painted Landscape with Saint George and the Dragon in 1629–30. The landscape is modelled on the Thames Valley, and the central figures of Saint George (England's patron saint) and a maiden resemble the king and queen. The dragon of war lies slain under Charles's foot. ^ For example, James I ruled without Parliament between 1614 and 1621. ^ For comparison, a typical farm labourer could earn 8d a day, or about £10 a year. ^ The statute forbade grants of monopolies to individuals but Charles circumvented the restriction by granting monopolies to companies. ^ The Scots were promised £400,000 in instalments. ^ In 1813, part of Charles's beard, a piece of neck bone, and a tooth were taken as relics. They were placed back in the tomb in 1888. 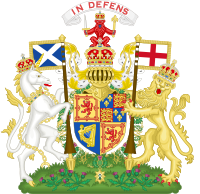 ^ a b James V and Margaret Douglas were both children of Margaret Tudor, the daughter of Henry VII of England: James V by James IV of Scotland, Margaret by Archibald Douglas, Earl of Angus. ^ a b Christian III and Elizabeth were both children of Frederick I of Denmark: Christian by Anne of Brandenburg, Elizabeth by Sophia of Pomerania. ^ Cust 2005, p. 2; Weir 1996, p. 252. ^ Gregg 1981, pp. 4–5. ^ Cust 2005, p. 2. ^ Carlton 1995, p. 2. ^ Carlton 1995, p. 3; Gregg 1981, p. 9. ^ a b Gregg 1981, p. 11. ^ a b Gregg 1981, p. 12. ^ Gregg 1981, p. 13. ^ Gregg 1981, p. 16; Hibbert 1968, p. 22. ^ a b Carlton 1995, p. 16. ^ a b Gregg 1981, p. 22. ^ Gregg 1981, pp. 18–19; Hibbert 1968, pp. 21–23. ^ Gregg 1981, p. 29. ^ Gregg 1981, p. 47. ^ Hibbert 1968, p. 24. ^ Hibbert 1968, p. 49; Howat 1974, pp. 26–28. ^ Gregg 1981, p. 63; Howat 1974, pp. 27–28; Kenyon 1978, p. 79. ^ Cust 2005, p. 5; Hibbert 1968, pp. 49–50. ^ Coward 2003, p. 152. ^ Gregg 1981, pp. 67–68; Hibbert 1968, pp. 49–50. ^ Carlton 1995, p. 31. ^ Cust 2005, p. 8. ^ Cust 2005, pp. 5–9. ^ Carlton 1995, p. 33; Gregg 1981, p. 68. ^ Cust 2005, p. 4; Hibbert 1968, pp. 30–32. ^ Carlton 1995, pp. 34–38; Cust 2005, pp. 32–34; Gregg 1981, pp. 78–82; Quintrell 1993, p. 11. ^ Gregg 1981, pp. 87–89; Quintrell 1993, p. 11; Sharpe 1992, p. 5. ^ Gregg 1981, p. 84. ^ Gregg 1981, pp. 85–87. ^ Carlton 1995, pp. 42–43; Cust 2005, pp. 34–35. ^ Carlton 1995, p. 46; Cust 2005, p. 31; Gregg 1981, p. 90; Hibbert 1968, p. 63; Quintrell 1993, p. 11; Sharpe 1992, pp. 5–6. ^ Carlton 1995, p. 47; Cust 2005, pp. 36–38; Gregg 1981, p. 94; Sharpe 1992, p. 6. ^ Gregg 1981, pp. 97–99. ^ Carlton 1995, p. 52; Gregg 1981, p. 99; Hibbert 1968, p. 64. ^ Carlton 1995, p. 56; Gregg 1981, p. 124; Kenyon 1978, p. 92; Schama 2001, p. 65. ^ Trevelyan 1922, p. 130. ^ Carlton 1995, p. 47; Gregg 1981, pp. 103–105; Howat 1974, p. 31. ^ Gregg 1981, p. 114; Hibbert 1968, p. 86; Weir 1996, p. 252. ^ Carlton 1995, p. 38; Gregg 1981, p. 80. ^ Gregg 1981, p. 126. ^ Carlton 1995, pp. 55, 70. ^ Quintrell 1993, pp. 16, 21. ^ Carlton 1995, p. 76; Gregg 1981, p. 156; Weir 1996, p. 252. ^ Gregg 1981, pp. 130–131. ^ Cust 2005, pp. 84–86. ^ Coward 2003, p. 153. ^ Gregg 1981, p. 131. ^ Cust 2005, p. 46; Gregg 1981, p. 129. ^ Carlton 1995, pp. 68–69; Gregg 1981, p. 129. ^ Gregg 1981, p. 129; Smith 1999, pp. 54, 114. ^ Smith 1999, pp. 54, 114. ^ Gregg 1981, p. 138. ^ Carlton 1995, pp. 71–75; Cust 2005, pp. 50–52; Gregg 1981, pp. 138–147; Quintrell 1993, pp. 21–28. ^ Gregg 1981, p. 150. ^ Carlton 1995, p. 80; Gregg 1981, pp. 149–151. ^ Loades 1974, pp. 369–370. ^ Carlton 1995, pp. 75, 81; Quintrell 1993, p. 29. ^ Carlton 1995, pp. 86–88; Gregg 1981, pp. 154–160; Hibbert 1968, pp. 91–95. ^ Howat 1974, p. 35. ^ Gregg 1981, pp. 173–174. ^ Coward 2003, p. 162; Cust 2005, p. 67. ^ Gregg 1981, pp. 170–173. ^ Carlton 1995, p. 101; Cust 2005, p. 74; Quintrell 1993, p. 39. ^ Cust 2005, p. 75; Gregg 1981, p. 175; Quintrell 1993, p. 40. ^ Carlton 1995, pp. 103–104; Cust 2005, p. 76; Gregg 1981, pp. 175–176; Kenyon 1978, p. 104. ^ Quoted in Cust 2005, p. 77. ^ Carlton 1995, p. 104; Gregg 1981, p. 176. ^ Carlton 1995, pp. 110–112; Sharpe 1992, pp. 48–49. ^ Howat 1974, p. 38; Kenyon 1978, pp. 107–108. ^ Carlton 1995, pp. 112–113; Kenyon 1978, p. 105; Sharpe 1992, pp. 170–171. ^ Carlton 1995, p. 107; Sharpe 1992, p. 168. ^ Carlton 1995, p. 113; Hibbert 1968, pp. 109–111; Sharpe 1992, pp. 170–171. ^ Cust 2005, pp. 148–150; Hibbert 1968, p. 111. ^ Gregg 1981, pp. 190–195. ^ Carlton 1995, p. 146; Cust 2005, p. 161; Gregg 1981, p. 195. ^ Carlton 1995, p. 146; Cust 2005, p. 161. ^ Cust 2005, pp. 114–115. ^ Quintrell 1993, p. 42. ^ Cust 2005, p. 118; Gregg 1981, p. 185; Quintrell 1993, p. 43. ^ Cust 2005, p. 118; Gregg 1981, p. 186; Robertson 2005, p. 35. ^ Cust 2005, p. 118; Gregg 1981, p. 186; Quintrell 1993, p. 43. ^ Carlton 1995, p. 121; Hibbert 1968, p. 108. ^ Cust 2005, pp. 121–122. ^ Carlton 1995, pp. 169–171; Gregg 1981, pp. 187–197; Howat 1974, p. 38; Sharpe 1992, pp. 65–68. ^ Carlton 1995, pp. 153–154; Sharpe 1992, p. xv. ^ Sharpe 1992, p. 603. ^ Starkey 2006, p. 104. ^ Weightman 1906, p. 185. ^ Gregg 1981, p. 40. ^ Sharpe 1992, pp. 509–536, 541–545, 825–834. ^ Gregg 1981, p. 220. ^ Carlton 1995, p. 190; Gregg 1981, p. 228. ^ Edwards 1999, p. 18. ^ Carlton 1995, p. 191; Quintrell 1993, p. 62. ^ Adamson 2007, pp. 8–9; Sharpe 1992, pp. 585–588. ^ Cust 2005, pp. 130, 193; Quintrell 1993, p. 64. ^ Cust 2005, p. 194; Gregg 1981, pp. 301–302; Quintrell 1993, pp. 65–66. ^ Loades 1974, p. 385. ^ Coward 2003, p. 167; Gregg 1981, pp. 215–216; Hibbert 1968, p. 138; Loades 1974, p. 385. ^ Young 1997, p. 97. ^ Carlton 1995, p. 185; Cust 2005, pp. 212–217; Gregg 1981, p. 286; Quintrell 1993, pp. 12–13. ^ Carlton 1995, p. 190; Gregg 1981, pp. 224–227; Quintrell 1993, pp. 61–62; Sharpe 1992, pp. 116–120. ^ Sharp 1980, pp. 82 ff. ^ Gregg 1981, pp. 312–313. ^ Sharpe 1992, p. 906. ^ Gregg 1981, p. 314. ^ Cust 2005, pp. 97–103. ^ Donaghan 1995, pp. 65–100. ^ Howat 1974, pp. 40–46. ^ Cust 2005, p. 133. ^ Coward 2003, pp. 174–175; Cust 2005, pp. 133–147; Gregg 1981, pp. 267, 273; Sharpe 1992, pp. 284–292, 328–345, 351–359. ^ Coward 2003, p. 175; Sharpe 1992, pp. 310–312. ^ Coward 2003, pp. 175–176. ^ Coward 2003, p. 176; Kenyon 1978, pp. 113–115; Loades 1974, p. 393; Sharpe 1992, p. 382. ^ Coward 2003, p. 176; Sharpe 1992, pp. 680, 758–763. ^ Cust 2005, pp. 212, 219; Sharpe 1992, pp. 774–776. ^ Cust 2005, p. 219; Sharpe 1992, pp. 780–781. ^ Cust 2005, pp. 223–224; Gregg 1981, p. 288; Sharpe 1992, pp. 783–784; Starkey 2006, p. 107. ^ Carlton 1995, p. 195; Trevelyan 1922, pp. 186–187. ^ Carlton 1995, pp. 189–197; Cust 2005, pp. 224–230; Gregg 1981, pp. 288–289; Sharpe 1992, pp. 788–791. ^ Cust 2005, pp. 236–237. ^ Carlton 1995, pp. 197–199; Cust 2005, pp. 230–231; Sharpe 1992, pp. 792–794. ^ Adamson 2007, p. 9; Gregg 1981, pp. 290–292; Sharpe 1992, pp. 797–802. ^ Adamson 2007, p. 9; Cust 2005, pp. 246–247; Sharpe 1992, pp. 805–806. ^ Adamson 2007, pp. 9–10; Cust 2005, p. 248. ^ Howat 1974, pp. 44, 66; Sharpe 1992, pp. 809–813, 825–834, 895. ^ Cust 2005, p. 251; Gregg 1981, p. 294. ^ a b Adamson 2007, p. 11. ^ Loades 1974, p. 401. ^ Loades 1974, p. 402. ^ Adamson 2007, p. 14. ^ Adamson 2007, p. 15. ^ Adamson 2007, p. 17. ^ Carlton 1995, pp. 211–212; Cust 2005, pp. 253–259; Gregg 1981, pp. 305–307; Loades 1974, p. 402. ^ a b c d Kishlansky & Morrill 2008. ^ Gregg 1981, p. 243. ^ Cust 2005, pp. 185–186; Quintrell 1993, p. 114. ^ Quintrell 1993, p. 46. ^ Sharpe 1992, p. 132. ^ Stevenson 1973, pp. 183–208. ^ Gregg 1981, pp. 313–314; Hibbert 1968, pp. 147, 150. ^ Stevenson 1973, p. 101. ^ Cust 2005, pp. 262–263; Gregg 1981, pp. 313–315. ^ Cust 2005, pp. 264–265; Sharpe 1992, pp. 914–916. ^ Carlton 1995, p. 214; Cust 2005, pp. 265–266; Sharpe 1992, pp. 916–918. ^ Gregg 1981, p. 315; Stevenson 1973, pp. 212–213. ^ Loades 1974, p. 404; Stevenson 1973, pp. 212–213. ^ Carlton 1995, p. 216; Gregg 1981, pp. 317–319. ^ Gregg 1981, p. 323. ^ Gregg 1981, pp. 324–325. ^ Cust 2005, p. 276; Russell 1991, p. 225. ^ Carlton 1995, p. 220; Gregg 1981, p. 326. ^ Gregg 1981, p. 327; Hibbert 1968, pp. 151–153. ^ Carlton 1995, p. 222; Gregg 1981, p. 328; Hibbert 1968, p. 154. ^ Carlton 1995, p. 222; Hibbert 1968, p. 154 and Sharpe 1992, p. 944 assume that Pym was involved with the launch of the bill; Russell 1991, p. 288, quoting and agreeing with Gardiner, suspects that it was initiated by Pym's allies only. ^ Carlton 1995, pp. 222–223; Cust 2005, p. 282; Gregg 1981, p. 330. ^ Hibbert 1968, pp. 154–155. ^ Gregg 1981, p. 330; see also Cust 2005, p. 282 and Sharpe 1992, p. 944. ^ Gregg 1981, pp. 329, 333. ^ a b Kenyon 1978, p. 127. ^ Carlton 1995, p. 223; Cust 2005, p. 287; Gregg 1981, pp. 333–334; Hibbert 1968, p. 156. ^ Coward 2003, p. 191; Gregg 1981, p. 334; Hibbert 1968, pp. 156–157. ^ Hibbert 1968, p. 156; Kenyon 1978, pp. 127–128. ^ Gregg 1981, p. 335; Kenyon 1978, p. 128. ^ Kenyon 1978, p. 129. ^ Kenyon 1978, p. 130. ^ Carlton 1995, pp. 225–226; Starkey 2006, p. 112. ^ Carlton 1995, p. 226; Kenyon 1978, p. 133; Stevenson 1973, pp. 238–239. ^ Carlton 1995, p. 183; Robertson 2005, pp. 42–43. ^ Gillespie 2006, p. 125. ^ Coward 2003, p. 172. ^ Carlton 1995, pp. 183, 229; Robertson 2005, p. 42. ^ Gillespie 2006, p. 130. ^ Gillespie 2006, p. 131. ^ Gillespie 2006, p. 137. ^ Carlton 1995, p. 229; Cust 2005, p. 306. ^ Russell 1991, p. 298. ^ Gillespie 2006, p. 3. ^ Loades 1974, p. 413; Russell 1990, p. 43. ^ Cust 2005, pp. 307–308; Russell 1990, p. 19. ^ Schama 2001, p. 118. ^ Starkey 2006, p. 112. ^ Gregg 1981, pp. 340–341; Loades 1974, p. 415; Smith 1999, p. 127; Starkey 2006, p. 113. ^ Kenyon 1978, p. 135; Smith 1999, p. 128. ^ Loades 1974, p. 414. ^ Carlton 1995, p. 230; Schama 2001, pp. 118–120. ^ Gillespie 2006, p. 144; Schama 2001, pp. 118–120. ^ Loades 1974, pp. 416–417; Schama 2001, pp. 118–120. ^ Gregg 1981, pp. 341–342. ^ Coward 2003, p. 200. ^ Kenyon 1978, p. 136. ^ Carlton 1995, p. 237. ^ Smith 1999, p. 129. ^ Kenyon 1978, p. 137. ^ Carlton 1995, pp. 235–236; Cust 2005, pp. 323–324; Gregg 1981, p. 343; Hibbert 1968, p. 160; Loades 1974, p. 417. ^ Starkey 2006, p. 113. ^ Carlton 1995, p. 232; Cust 2005, p. 320; Hibbert 1968, p. 177. ^ Cust 2005, pp. 321–324; Gregg 1981, p. 343; Hibbert 1968, p. 178; Starkey 2006, pp. 113–114. ^ Carlton 1995, p. 232; Cust 2005, pp. 320–321; Hibbert 1968, p. 179. ^ Carlton 1995, p. 233; Gregg 1981, p. 344. ^ Robertson 2005, p. 62. ^ Starkey 2006, p. 114. ^ Loades 1974, p. 418; Starkey 2006, pp. 114–115. ^ Gregg 1981, p. 344. ^ Loades 1974, p. 418. ^ Cust 2005, pp. 326–327; Hibbert 1968, pp. 180–181. ^ Carlton 1995, pp. 234, 236; Hibbert 1968, p. 181. ^ Carlton 1995, pp. 237–238; Hibbert 1968, pp. 181–182. ^ Carlton 1995, p. 238; Cust 2005, pp. 338–341; Gregg 1981, p. 351. ^ Cust 2005, p. 350. ^ Cust 2005, p. 352; Hibbert 1968, p. 182; Loades 1974, p. 422. ^ Loades 1974, pp. 423–424. ^ Gregg 1981, pp. 366–367. ^ Carlton 1995, p. 248. ^ Gregg 1981, p. 368. ^ a b Carlton 1995, p. 249. ^ Gregg 1981, pp. 378, 385; Hibbert 1968, pp. 195–198. ^ Carlton 1995, p. 257. ^ Carlton 1995, p. 258. ^ Gregg 1981, pp. 381–382. ^ Gregg 1981, pp. 382–386. ^ Gregg 1981, pp. 388–389. ^ Cust 2005, pp. 403–405; Gregg 1981, pp. 396–397; Holmes 2006, pp. 72–73. ^ Carlton 1995, p. 294; Cust 2005, p. 408; Gregg 1981, p. 398; Hibbert 1968, pp. 230, 232–234, 237–238. ^ Carlton 1995, p. 300; Gregg 1981, p. 406; Robertson 2005, p. 67. ^ Carlton 1995, pp. 303, 305; Cust 2005, p. 420; Gregg 1981, pp. 407–408. ^ Carlton 1995, p. 309; Hibbert 1968, p. 241. ^ Gregg 1981, p. 411. ^ Carlton 1995, p. 310; Cust 2005, pp. 429–430; Gregg 1981, pp. 411–413. ^ Coward 2003, pp. 224–236; Edwards 1999, p. 57; Holmes 2006, pp. 101–109. ^ Gregg 1981, pp. 412–414. ^ Carlton 1995, p. 311; Cust 2005, p. 431. ^ Carlton 1995, pp. 312–314. ^ Cust 2005, pp. 435–436. ^ Gregg 1981, p. 419; Hibbert 1968, p. 247. ^ Gregg 1981, pp. 419–420. ^ Cust 2005, p. 437; Hibbert 1968, p. 248. ^ Carlton 1995, pp. 329–330; Gregg 1981, p. 424. ^ Cust 2005, p. 442. ^ Carlton 1995, p. 331; Gregg 1981, p. 426. ^ Coward 2003, p. 237; Robertson 2005, p. 118. ^ Hibbert 1968, p. 251; Starkey 2006, pp. 122–124. ^ Gregg 1981, p. 429. ^ Carlton 1995, p. 336; Hibbert 1968, p. 252. ^ Coward 2003, p. 237; Starkey 2006, p. 123. ^ Edwards 1999, pp. 84–85; Robertson 2005, pp. 118–119; Starkey 2006, p. 123. ^ Carlton 1995, p. 326; Gregg 1981, p. 422. ^ Carlton 1995, pp. 335–337; Gregg 1981, pp. 429–430; Hibbert 1968, pp. 253–254. ^ Edwards 1999, p. 99; Gregg 1981, p. 432; Hibbert 1968, pp. 255, 273. ^ a b Robertson 2002, pp. 4–6. ^ Edwards 1999, pp. 99, 109. ^ Cust 2005, p. 452; Gregg 1981, p. 432; Robertson 2005, p. 137. ^ Gregg 1981, p. 433. ^ Edwards 1999, pp. 125–126; Gregg 1981, p. 436. ^ Gregg 1981, pp. 435–436; Robertson 2005, pp. 143–144. ^ Gregg 1981, between pages 420 and 421. ^ a b Gardiner 1906, pp. 371–374. ^ Robertson 2005, pp. 15, 148–149. ^ Gardiner 1906, pp. 371–374; Gregg 1981, p. 437; Robertson 2005, pp. 15, 149. ^ Carlton 1995, p. 304. ^ Carlton 1995, pp. 345–346; Edwards 1999, pp. 132–146; Gregg 1981, pp. 437–440. ^ Carlton 1995, p. 345; Robertson 2002, pp. 4–6. ^ Gardiner 1906, pp. 374–376. ^ Robertson 2005, p. 15. ^ Carlton 1995, p. 347; Edwards 1999, p. 146. ^ Gregg 1981, pp. 440–441. ^ Edwards 1999, p. 162; Hibbert 1968, p. 267. ^ Carlton 1995, pp. 350–351; Gregg 1981, p. 443; Hibbert 1968, pp. 276–277. 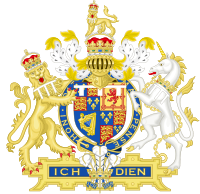 ^ a b Charles I (r. 1625–49), Official website of the British monarchy, retrieved 20 April 2013 . ^ Carlton 1995, p. 352; Edwards 1999, p. 168. ^ Carlton 1995, pp. 352–353; Gregg 1981, p. 443. ^ Carlton 1995, p. 353; Edwards 1999, p. 178; Gregg 1981, p. 444; Hibbert 1968, p. 279; Holmes 2006, p. 93. ^ Carlton 1995, p. 353; Edwards 1999, p. 179; Gregg 1981, p. 444; Hibbert 1968, pp. 157, 279. ^ Gregg 1981, p. 444; see also a virtually identical quote in Edwards 1999, p. 180. ^ Carlton 1995, p. 354; Edwards 1999, p. 182; Hibbert 1968, p. 279; Starkey 2006, p. 126. ^ Carlton 1995, p. 354; Edwards 1999, p. 183; Gregg 1981, pp. 443–444. ^ Hibbert 1968, pp. 279–280; Robertson 2005, p. 200. ^ Hibbert 1968, p. 280. ^ Edwards 1999, p. 184; Gregg 1981, p. 445; Hibbert 1968, p. 280. ^ Edwards 1999, p. 197; Gregg 1981, p. 445; Hibbert 1968, p. 280. ^ Edwards 1999, p. 173. ^ Robertson 2005, p. 201. ^ Robertson 2005, p. 333. ^ a b Edwards 1999, p. 183. ^ Edwards 1999, p. 183; Gregg 1981, p. 445. ^ a b Gregg 1981, p. 445. ^ Edwards 1999, p. 188; Gregg 1981, p. 445. ^ Edwards 1999, p. 189; Gregg 1981, p. 445. ^ Gregg 1981, p. 445; Robertson 2005, pp. 208–209. ^ Cust 2005, p. 461. ^ Mitchell 2012, p. 99. ^ Edwards 1999, p. 190; Kenyon 1978, p. 166. ^ Edwards 1999, p. 190; Kenyon 1978, pp. 166–168; Loades 1974, pp. 450–452. ^ Holmes 2006, p. 121; Kenyon 1978, p. 170; Loades 1974, p. 454. ^ Edwards 1999, p. 190; Loades 1974, pp. 455–459. ^ Holmes 2006, p. 174; Kenyon 1978, p. 177; Loades 1974, p. 459. ^ Holmes 2006, pp. 175–176; Kenyon 1978, pp. 177–180. ^ Gregg 1981, p. 83; Hibbert 1968, p. 133. ^ Carlton 1995, p. 141; Cust 2005, pp. 156–157; Gregg 1981, p. 194; Hibbert 1968, p. 135. ^ Gregg 1981, p. 83. ^ Carlton 1995, p. 145; Hibbert 1968, p. 134. ^ Millar 1958, p. 6. ^ Gregg 1981, pp. 167–169; see also Carlton 1995, p. 142; Cust 2005, p. 157 and Hibbert 1968, p. 135. ^ Gregg 1981, pp. 249–250, 278. ^ Carlton 1995, p. 142. ^ Carlton 1995, p. 143. ^ Kenyon 1978, p. 93. ^ Cust 2005, pp. 414, 466; Kenyon 1978, p. 93. ^ Carlton 1995, p. xvi; Coward 2003, p. xxiii; Cust 2005, pp. 472–473. ^ Carlton 1995, p. xvii; Coward 2003, p. xxii; Cust 2005, p. 466. ^ Coward 2003, p. xxii. ^ Kenyon 1978, p. 93; Robertson 2005, p. 32. ^ Cust 2005, pp. 466–474. ^ Kenyon 1978, p. 94; Sharpe 1992, p. 198. ^ Gardiner 1906, p. 83. ^ a b c d Weir 1996, p. 252. ^ Wallis 1921, p. 61. ^ Weir 1996, p. 286. ^ Edwards 1999, p. 160; Gregg 1981, pp. 436, 440. ^ a b Cokayne, Gibbs & Doubleday 1913, p. 445; Weir 1996, p. 252. ^ Ashmole 1715, p. 532. ^ Ashmole 1715, pp. 531, 534. ^ Johnston 1906, p. 18. ^ Weir 1996, pp. 252–254. ^ Cokayne, Gibbs & Doubleday 1913, p. 446. ^ a b c d e f g h i j Louda & Maclagan 1999, pp. 27, 50. The Second Parliament of Charles I was summoned by Charles I of England on 26 December 1625 in another attempt to solve his growing monetary problems. The Bust of Charles I was a sculptural bust produced by the Italian artist Gianlorenzo Bernini which according to one historian, "set the visual conventions for centuries … [establishing itself as] the official portrait of secular absolutism.". The sculpture was of the then king Charles I of England, who had commissioned the work himself, writing to Bernini that the artist's name was "exalted above those of all men of talent who have exercised your profession.". Bernini did not travel to London to undertake the work; rather he made use of a painted triple portrait of Charles I (i.e. a view of Charles from three points) created especially by the Flemish artist Anthony Van Dyck for Bernini. Despite not meeting Charles I face-to-face, Bernini's bust was considered a success at the time, and the English king rewarded Bernini with jewellery worth over 4,000 Roman scudi (a figure over 60 times the average yearly salary of a worker in Rome).There had also been plans for Bernini to create a portrait of Charles' wife, Henrietta Maria, but the advent of the English Civil War quickly put an end to the project. The bust of Charles I no longer exists; it was most likely destroyed in the Palace of Whitehall fire of 1698. Numerous copies of the image exist in other forms (e.g. engravings, bronze sculptures).For a while in 19th and early 20th centuries, there was a belief in England and elsewhere that Bernini had also created a bust of Oliver Cromwell, the victor over Charles I in the English Civil War. However, the attribution was refuted in 1922. Charles I at the Hunt - also known under its French title, Le Roi à la chasse - is an oil-on-canvas portrait of Charles I of England by Anthony van Dyck c.1635, now in the Louvre Museum, Paris.
. 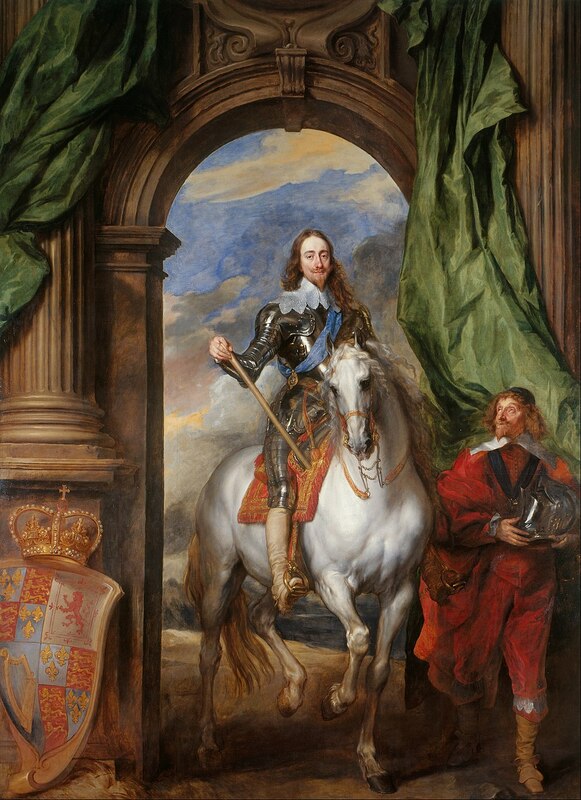 It depicts Charles in civilian clothing and standing next to a horse as if resting on a hunt, in a manner described by the Louvre as a "subtle compromise between gentlemanly nonchalance and regal assurance".Van Dyck gives his naturalistic style full expression: "Charles is given a totally natural look of instinctive sovereignty, in a deliberately informal setting where he strolls so negligently that that he seems at first glance nature's gentleman rather than England's King". The 105 centimetres (41 in) by 76 centimetres (30 in) painting depicts Charles in lighter colours to the left of the painting, standing against the darker ground and the shadowed servants and horse under a tree to the right; his dark hat prevents his face from appearing washed out by the sky. Charles is dismounted, and stands as if surveying his domain and the sea beyond (perhaps the Solent with the Isle of Wight visible in the distance). His head is turned and his face pinched in a disdainful and somewhat bitter smile. The king was famously sensitive about his height, and the painting compensates by placing the viewer at a low angle point of view, looking up at the king. Latin inscription on a rock in the lower right corner establishes his rights as a king; "Carolus.I.REX Magnae Britanniae" (Charles I, King of Great Britain - a political statement at the time, only 32 years after his father James had united the crowns of Scotland and England, and proclaimed himself King of Great Britain, and nearly 70 years before the Acts of Union legally created the Kingdom of Great Britain). Charles is dressed as an aristocratic gentleman in a wide-brimmed Cavalier hat, teardrop earring, shimmering silver satin doublet, red breeches, and turned-down leather boots, apparently resting during a day of hunting. He is girt with a sword, with one hand resting nonchalantly on a walking stick; the other rests on his hip, holding his gloves as a sign of his sovereignty and assurance. The painting also shows a young page and Charles' picture-buying agent and favoured courtier, Endymion Porter, who is holding the horse. The horse seemingly bows its head in submission to the king. In his three years as Principal Painter in Ordinary, Van Dyck had already made two other equestrian portraits of Charles in armour: Charles I with M. de St Antoine depicting Charles accompanied by his riding master, Pierre Antoine Bourdon, Seigneur de St Antoine; and Equestrian Portrait of Charles I depicting Charles as a heroic philosopher king, contemplatively surveying his domain. Charles paid van Dyck £100 for the painting in 1638 - although the artist originally requested £200 - but it is not mentioned in the inventory of his collections after his execution. It was in France by 1738, and the Comtesse du Barry sold the painting to Louis XVI of France in 1775. The Church of King Charles the Martyr is a Church of England parish church in Royal Tunbridge Wells, Kent, England. It is a Grade I listed building. Charles I of England has been depicted in popular culture a number of times. The Engagers were a faction of the Scottish Covenanters, who made "The Engagement" with King Charles I in December 1647 while he was imprisoned in Carisbrooke Castle by the English Parliamentarians after his defeat in the First Civil War. The equestrian statue of Charles I at Charing Cross, London, is a work by the French sculptor Hubert Le Sueur, probably cast in 1633. Its location at Charing Cross is on the former site of the most elaborate of the Eleanor crosses erected by Edward I, which had stood for three and a half centuries until 1647. Charing Cross is used to define the centre of London and a plaque by the statue indicates that road signage distances are measured from this point. The statue faces down Whitehall towards Charles I's place of execution at Banqueting House.The first Renaissance-style equestrian statue in England, it was commissioned by Charles's Lord High Treasurer Richard Weston for the garden of his country house in Roehampton, Surrey (now in South London). Following the English Civil War the statue was sold to a metalsmith to be broken down, but he hid it until the Restoration. It was installed in its current, far more prominent location in the centre of London in 1675, and the elaborately carved plinth dates from that time. The Grand Remonstrance was a list of grievances presented to King Charles I of England by the English Parliament on 1 December 1641, but passed by the House of Commons on 22 November 1641, during the Long Parliament; it was one of the chief events which were to precipitate the English Civil War. Henrietta of England (16 June 1644 O.S. (26 June 1644 N.S.) – 30 June 1670) was the youngest daughter of King Charles I of England, Scotland and Ireland and his wife, Henrietta Maria of France. Fleeing England with her governess at the age of three, she moved to the court of her first cousin Louis XIV of France, where she was known as Minette. After she married Philippe I, Duke of Orléans, brother of King Louis XIV, known as Monsieur, she became known as Madame. Her marriage was marked by frequent tensions. Henrietta was instrumental in negotiating the Secret Treaty of Dover, in June 1670 – early in the same month as her unexpected death. Jacobite claims to the throne of Great Britain following the death of Henry Benedict Stuart descend from her through her daughter Anne Marie, Queen of Sardinia. For the modern court, see High Court of Justice. The High Court of Justice was the court established by the Rump Parliament to try King Charles I of England. This was an ad hoc tribunal created specifically for the purpose of trying the king, although the name was used for subsequent courts. 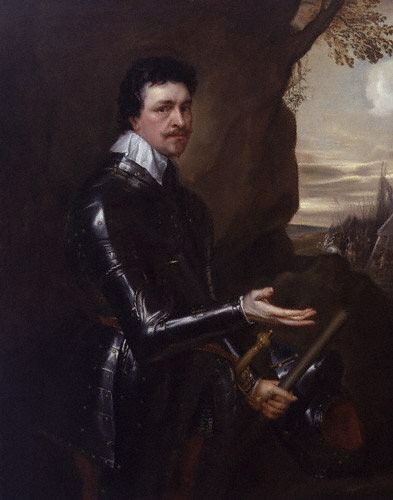 Sir John Harvey (died 1646) was a Crown Governor of Virginia. He was appointed to the position on 26 March 1628 by Charles I of England. In 1635 he was suspended and impeached by the Council of Virginia (who named John West as a temporary replacement), and he returned to England. Charles I restored him to his post in 1636. He returned to Virginia in January 1637 and served until November 1639. His government has been described as tyrannical and Harvey himself has been called "an obnoxious ruler" and was generally held to be unpopular.In 1639 Harvey was replaced as governor by Sir Francis Wyatt.He owned Boldrup Plantation. The Personal Rule (also known as the Eleven Years' Tyranny) was the period from 1629 to 1640, when King Charles I of England, Scotland and Ireland ruled without recourse to Parliament. The King claimed that he was entitled to do this under the Royal Prerogative. Charles had already dissolved three Parliaments by the third year of his reign in 1628. After the murder of George Villiers, Duke of Buckingham, who was deemed to have a negative influence on Charles' foreign policy, Parliament began to criticize the king more harshly than before. Charles then realized that, as long as he could avoid war, he could rule without Parliament. The broad definition of regicide (Latin: regis "of king" + cida "killer" or cidium "killing") is the deliberate killing of a monarch, or the person responsible for the killing of a person of royalty. In the British tradition, it refers to the judicial execution of a king after a trial, reflecting the historical precedent of the trial and execution of Charles I of England. More broadly, it can also refer to the killing of an emperor or any other reigning sovereign. Roundheads were supporters of the Parliament of England during the English Civil War (1641–1652). Also known as Parliamentarians, they fought against King Charles I of England and his supporters, known as the Cavaliers or Royalists, who claimed rule by absolute monarchy and the principle of the 'divine right of kings'. The goal of the Roundhead party was to give the Parliament supreme control over executive administration of the country/kingdom. The Rump Parliament was the English Parliament after Colonel Thomas Pride purged the Long Parliament, on 6 December 1648, of those members hostile to the Grandees' intention to try King Charles I for high treason. "Rump" normally means the hind end or back-side of a mammal; its use meaning "remnant" was first recorded in the above context in English. Since 1649, the term "rump parliament" has been used to refer to any parliament left over from the actual legitimate parliament. The Short Parliament was a Parliament of England that was summoned by King Charles I of England on 20 February 1640 and sat from 13 April to 5 May 1640. It was so called because of its short life of only three weeks. After 11 years of attempting Personal Rule between 1629 and 1640, Charles recalled Parliament in 1640 on the advice of Lord Wentworth, recently created Earl of Strafford, primarily to obtain money to finance his military struggle with Scotland in the Bishops' Wars. However, like its predecessors, the new parliament had more interest in redressing perceived grievances occasioned by the royal administration than in voting the King funds to pursue his war against the Scottish Covenanters. John Pym, MP for Tavistock, quickly emerged as a major figure in debate; his long speech on 17 April expressed the refusal of the House of Commons to vote subsidies unless royal abuses were addressed. John Hampden, in contrast, was persuasive in private: he sat on nine committees. A flood of petitions concerning royal abuses were coming up to Parliament from the country. Charles's attempted offer to cease the levying of ship money did not impress the House. Annoyed with the resumption of debate on Crown privilege and the violation of Parliamentary privilege by the arrest of the nine members in 1629, and unnerved about an upcoming scheduled debate on the deteriorating situation in Scotland, Charles dissolved Parliament on 5 May 1640, after only three weeks' sitting. It would be followed later in the year by the Long Parliament. The Society of King Charles the Martyr is an Anglican devotional society dedicated to the cult of King Charles the Martyr, a title of Charles I of England (1600–1649). It is a member of the Catholic Societies of the Church of England, an Anglo-Catholic umbrella group. It is also active in the Scottish Episcopal Church and North America, and has international members elsewhere. The Useless Parliament was the first Parliament of England of the reign of King Charles I, sitting only from June until August 1625. It gained its name because it transacted no significant business, making it 'useless' from the king's point of view. Parliament adjourned to Oxford on 1 August, and was dissolved on 12 August, having offended the king. A Van Dyke (sometimes spelled Vandyke, or Van Dyck) is a style of facial hair named after the 17th-century Flemish painter Anthony van Dyck (1599–1641). A Van Dyke specifically consists of any growth of both a moustache and goatee with all hair on the cheeks shaven. Even this particular style, though, has many variants, including a curled moustache versus a non-curled one and a soul patch versus none. The style is sometimes called a "Charlie" after King Charles I of England, who was painted with this type of beard by van Dyck. "Pike-devant" or "pickedevant" are other little-known synonyms for a Van Dyke beard.